Buffalo Bills fans will be treated to a first-of-its-kind virtual-reality experience during home games at New Era Field. Two former RIT students, in connection with RIT’s MAGIC Spell Studios, have developed an interactive app that will provide users with an insider’s look at the locker room and the stadium field from ground level. 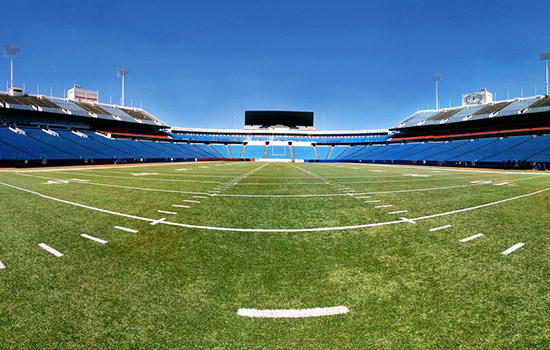 As the 2017-2018 NFL season kicks off, fans of the Buffalo Bills will be treated to a new virtual-reality experience at New Era Field, designed by RIT alumni, to help fans “see” the stadium from a unique perspective. 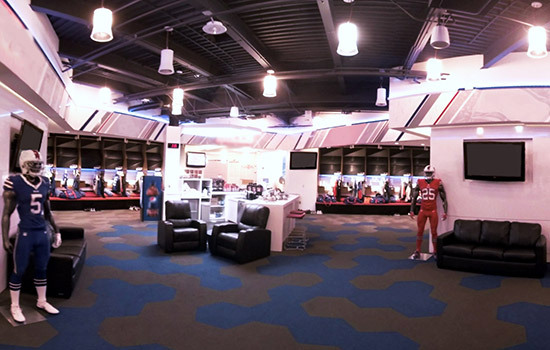 Rochester Institute of Technology’s MAGIC Spell Studios has, at the request of the Buffalo Bills, created an interactive app that will allow fans to experience the stadium at One Bills Drive in a 360-degree immersive environment, including walking onto the field through the tunnel and seeing inside the locker room. The app, which will be usable to fans on-site at New Era Field for Buffalo Bills home games this season starting Sept. 10, is the first of its kind in the NFL. The project, which has been in development since May 2017, was managed by Brenda Schlageter, operations manager at RIT’s MAGIC (Media, Arts, Games Interaction and Creativity) Center, and utilized the expertise of Zane Draper, a 2017 graduate of RIT’s game design and development program in the School of Interactive Games and Media; and Anna Dining, a 2017 graduate of School of Film and Animation’s motion picture science program. Together, they were part of several on-site visits to the stadium to capture the 360-degree views and co-developed the application underlying the fan experience. According to Andrew Phelps, director of RIT’s MAGIC Center, this kind of multi-disciplinary collaboration between technology, the arts and design is a strategic focus at RIT and a key component of the MAGIC Spell Studios effort. Schlageter said that she enjoyed collaborating with the former students. RIT’s MAGIC Center is a nonprofit university-wide research and development laboratory and a for-profit production studio that assists in efforts to bring digital media creations up to marketplace standards and commercialization. Faculty, staff and student researchers, artists and practitioners come together to create, contextualize and apply new knowledge in a multitude of related fields and disciplines as appropriate not only to STEM or the arts and humanities, but their intersection. RIT’s MAGIC Spell Studios, which officially launched in November and will move into a new building in 2018, focuses on nurturing and growing new companies and publishing and distributing their projects. The new facility, which will feature a sound stage, virtual reality laboratory, sound mixing and color correction facilities, among a variety of labs and incubation spaces, will continue to enhance the capabilities of the studio. For more information on MAGIC Spell Studios, go to magic.rit.edu.